I ran my practice hand dyeing workshop last Friday and thought I'd show you some photos. I had six students, just the right number for me to test out my teaching methods and see how much we could get through in a day. There were students who measured precisely and noted everything down, and then there were students who were true mad quilt scientists and just chucked a bit of this and a bit of that! Some beautiful colours emerged during the day. Luckily most of the students were part of my guild so I'll get to see the washed and dried fabric results, yay! We worked in my local community hall, a great big space with very cleanable floors. It was lots of fun and I can't wait to run another one. I learnt a few things to change in my handouts and how I structured the day, so it was really useful for me also. I also have a few more samples to dye, but that's no hardship as I love to dye and watching everyone else have fun with colour just whetted my appetite! I'm running a low-water immersion fabric dyeing course on Friday. It's a 'prototype' or test workshop with a group of my quilting club members to see how much info I can cover in one day, whether I've got all my handouts written correctly , and whether or not it's fun! This is hanging on my design wall today. It's one of my samples for the course. Any guesses on how I made it? Looking at the final product makes my mind whizz with possibilities. And I'm so looking forward to running this class, I love fabric dyeing!! I'll let you know how it goes, and stay tuned for some more sample pics. Want to learn the magic of tying a neat know when you are sewing on your quilt bindings? I used to tie ugly knots. Yup, being a mostly self-taught sewer and quilter, I didn't know there was a technique. I'd get myself in a tangle and it used to annoy me. I'd seen people tie knots fast and neatly but just didn't know there was a trick to it. One day I got around to learning how. I can't remember who taught me, but my knots are neat and tidy and look like a little bit of magic when I do it fast. So thank you anonymous teacher! I've taught a few people now too and it always makes my day when they get it. So I ventured into the realm of video tutorials and I've uploaded a knot-tying video to YouTube. Living Aboard - the good bits. Ahh, loving my life on the boat! This is super-high tide at the beach - the beach is a one minute walk away and I walk on it usually twice a day. The kids found a huge log floating and it became a boat, a diving platform and just the best water toy ever. Here's another thing I love about living on MV Cerego. We are five minutes walk from school. And it's such a great little small-town school. The kids planted, cared for and then get to eat from the school vege garden. That's my boy with cherry tomatoes. And how about this photo for inspiration? 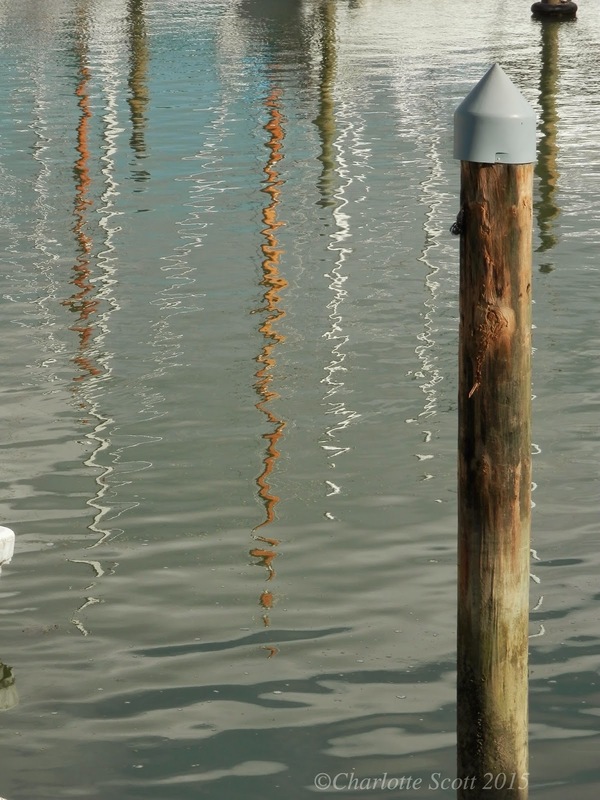 There are so many textures and shapes around the boats and the wharf - particularly the reflections in the water. I'm feeling a whole series of quilts coming on and I'm building up a huge library of photographs. We are also settling in more and more. Here are a couple of before and after photos of a corner in our bedroom cabin. We found a bookshelf (no great thing of beauty, but perfectly functional) and Hubby installed it. And now I have a little nook to sit in with books and magazines beside me. We also put up a bookshelf in the main saloon. With the one we put up in the kids play cabin a couple of months ago, that's all the books out from under the beds. 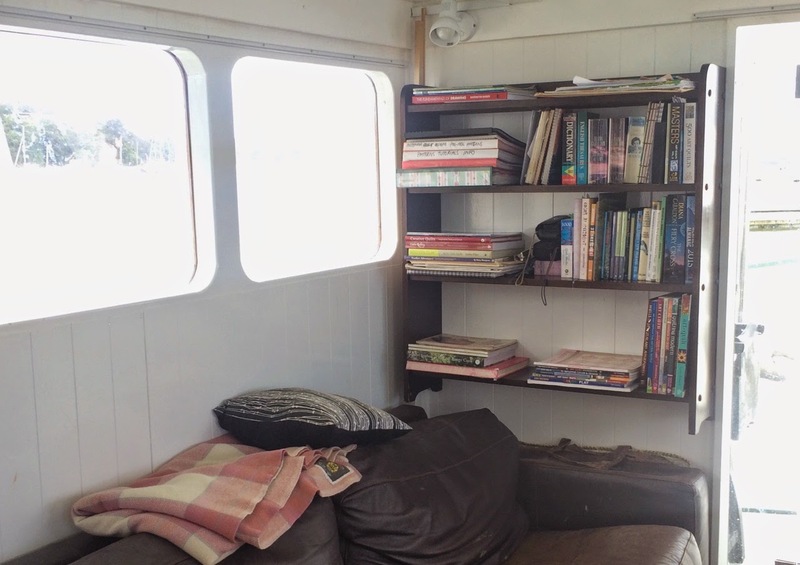 If you're wondering whether all the books will fall off when we are out to sea, then no, all three bookshelves are on crosswise bulkheads. The boat rocks from side to side in swells rather than tipping upwards and downwards. So the piles of books might shift and the ones standing up might fall over, but they are unlikely to go flying off the shelves across the cabin. But eventually we'll be putting little lips or straps across the shelves just for extra safety. Last but not least, I had a lovely visit from Yvonne Brown and her husband. 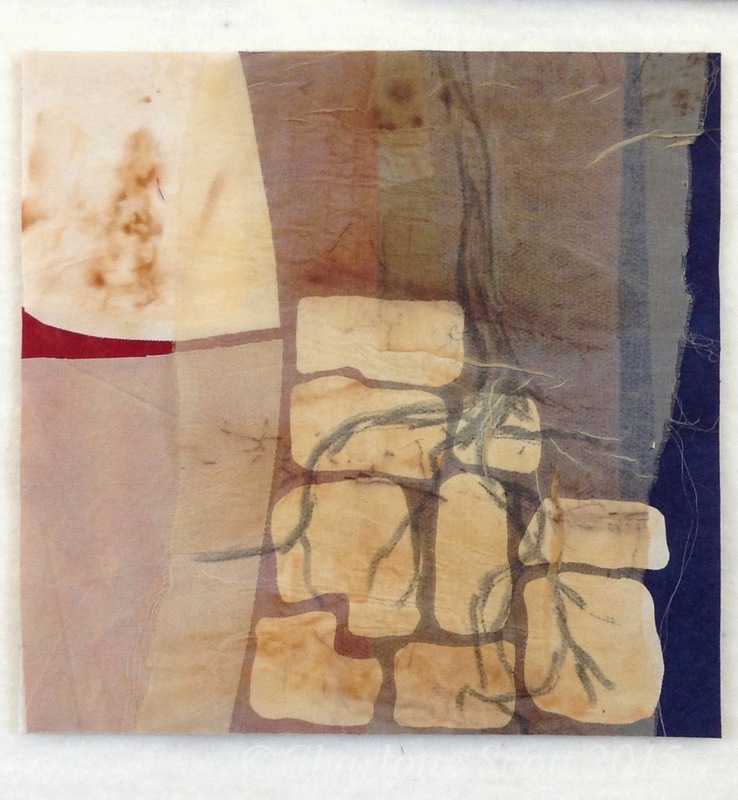 Yvonne is a talented textile artist from the UK. I met her when I took a class she taught in NZ at Queenstown Quilt Symposium in 2011. Recently Yvonne contacted me to say she would be over here again and could she come and visit. Yes! Go check out Yvonne's work on her website - it's gorgeous! 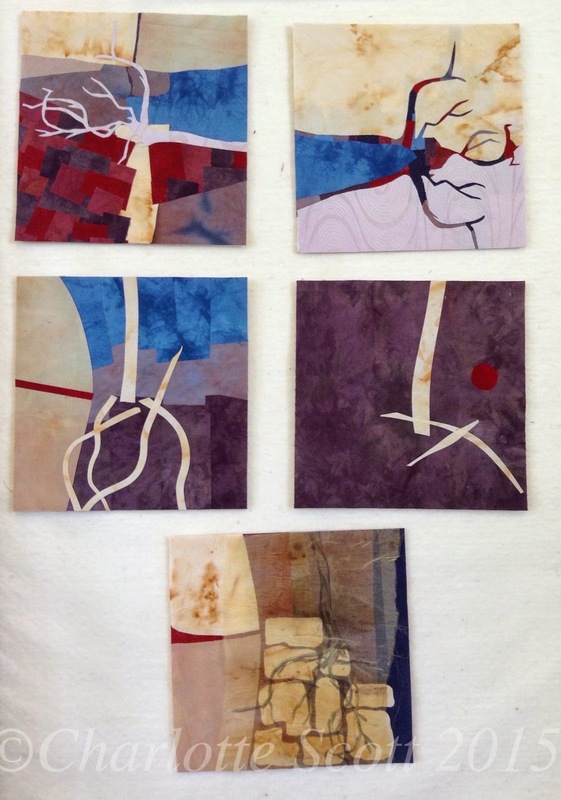 Sue Benner is a Texan textile artist who attended the Manawatu Quilt Symposium as a tutor. I attended one of Sue's classes and learnt a ton and I also had the privilege of interviewing Sue. My class with Sue was titled Driven to Abstraction and we completed many exercises on abstracting imagery, using different techniques and focusing on abstracting different aspects of the images. Here is one of the photos I was working from. 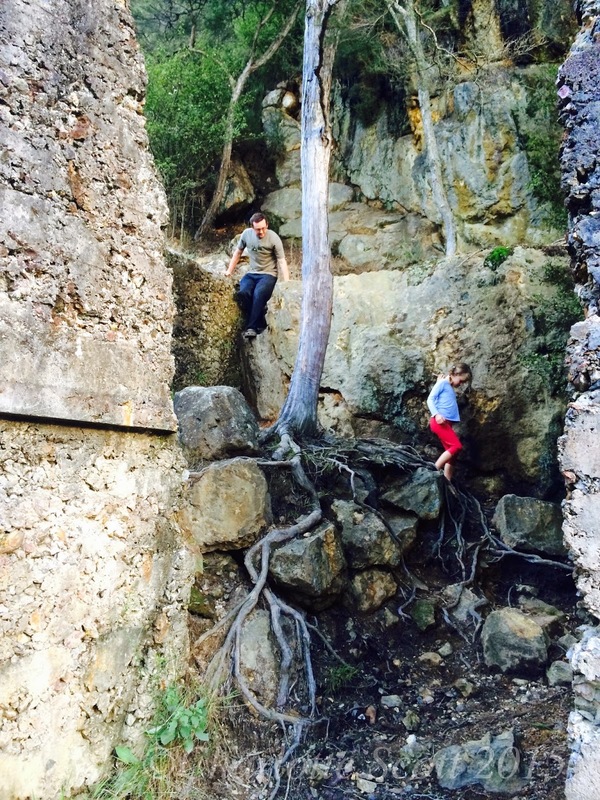 It's taken near Waihi, in the North Island of New Zealand, at an old power station on a river. Here are the small quilts I made from it. With a close up of the one that I think is most successful. 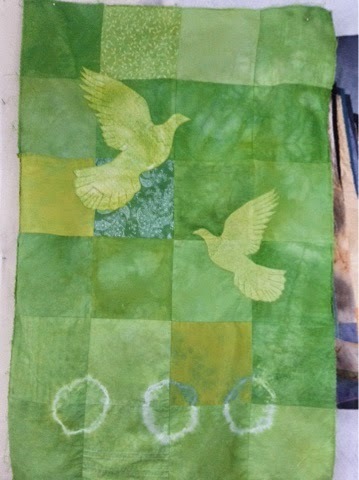 After these small exercises I started working on a larger quilt with cormorants as the subject. I've written and shown more of that quilt here. Sue was generous with her time and knowledge, and I was particularly impressed with her skills as a class facilitator. It's not always easy to get a class full of enthusiastic quilters to buckle down, stop talking and start working! I hope you enjoy my interview with Sue. I urge you to go and check out her website, her gallery section is truly inspiring. And if you live anywhere near Texas, Sue has an upcoming show in April at the Texas Quilt Museum.